Ultimate Marvel vs. Capcom 3 (アルティメット マーヴル VS. カプコン3, Arutimetto Māvuru bāsasu Kapukon Surī?) is a crossover fighting game developed by Capcom. It is an updated version of Marvel vs. Capcom 3: Fate of Two Worlds. After the events of the 2011 Tōhoku earthquake and tsunami disrupted the development schedule for downloadable content for the original game, the additional content was made into a standalone title for a discount retail price. 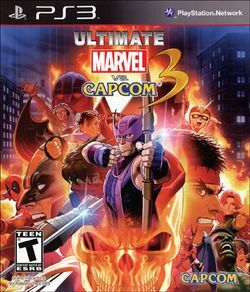 Ultimate Marvel vs. Capcom 3 was released in November 2011 for the PlayStation 3 and Xbox 360 and was featured as a launch title for the PlayStation Vita in 2012. This page was last edited on 24 December 2016, at 00:59.